GRAB A FEW FRIENDS & CALL A…WE WILL SCHEDULE A CLASS TIME THAT WORKS FOR YOU!! Click Title Next to Class to read more info & Register! Join us the second Saturday of Each Month for a Block Demo and Sew in for our 2019 BOM Please register..no fees for BOM participants. Demo will start promptly at 12:30 on Saturdays .....then onto the fun part...sewing those blocks! Master the art of curved piecing with this modern take on the traditional Winding Ways Pattern. Accuquilt makes the cutting fast & easy and the piecing a breeze with notches to help line it all up! Using your AccuQuilt cutting system and the 3 1/2? or 4 1/2? tumbler die create this fun flag wall hanging . Learn how to operate our Handi Quilter longarm machine. Whether you are doing the sewing version OR Machine Embroidery version of the Make Yourself At Home Quilt; you will want to join in the fun and journey along with like minded Kimberbell Enthusiasts! Club will meet every Monday in June. Back by popular demand! If you have never made a one block wonder quilt; or have and want to take it to the next level...hop on board for a journey you won't forget! What better way to honor our Veterans than with the start of our own "Quilted Nest - Quilts of Valor Group". Interested in Joining a QOV Group? If you are in the Southern NJ and surrounding areas and are interested in joining a QOV Group, our QOV Group at The Quilted Nest in Collingswood, NJ welcomes you. We will have programs like Monthly Sew In, Guest Speakers, Trunk Shows, QOV Retreats, a QOV quilt block program, National teachers and other opportunities in the shop with lots of fun creating Quilts of Valor for many deserving individuals. You don't need to be a quilter to join our QOV group. 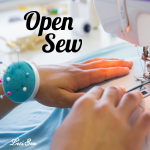 There is always a need for people at our Sew days to help iron, bind, help with presentations, fundraising and we also need people to help with quilting the QOV finished tops. If you are interested in the QOV group, stop in, email or call the store to register your name and get on our email list. (There is a nominal $5 Individual annual member fee collected by us on behalf of the QOVF.) We will have lots of exciting fun ahead of us! Our Group meets the 3rd Saturday of the month (full weeks). Please see our calendar of events for the dates. We work on our own QOV quilts and we plan group QOV quilts and other events for those days. These special fun group projects are announced in our Member Group QOV emails. We also have a QOV quilt block program. These block kits come with a free pattern and are $3.00 per kit. You don't have to be a QOV group member to purchase and make a block. They are for anyone who wants to contribute to this worthy cause. You may return the finished block to the store to use for one of our "Sew Days" and contribute to a QOV quilt. We change the design and fabrics of the Quilt blocks every so often so stay tuned for new ones to come. A little bit about Quilts of Valor for those of you that are new to the foundation. The mission of the Quilts of Valor Foundation is "To cover service members and veterans touched by war with comforting and healing Quilts of Valor." If you were not able to attend the kick off you can still join us. Throughout the year we will have lots of events making QOV quilts for many deserving individuals. There are many benefits of joining our QOV Group at The Quilted Nest listed below: To become a member: Stop in the shop to sign up. There is a nominal individual $5 member fee collected annually by us on behalf of the QOVF. No need to worry about this Sea Serpent rising from the water! 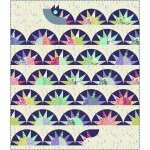 Learn to machine paper piece And set in curves with this fun Sea Serpent Quilt featuring Tula Pink Pinkerville fabrics. In one workshop students will learn to paper piece the points and set in the curves that make up each 8 inch block which are repeated throughout the quilt. We will also create the head and tail blocks. In 2.5 hours you'll learn how to thread it up and sew a straight line. We will then teach secrets about handling the machine that normally take forever to figure out on your own. And in the process of getting comfortable with the sewing machine, you will make a large drawstring bag to show for the effort! This Quick Start class is designed to take the mystery out of the sewing machine and get you up and sewing fast. Please plan on stopping in approx 1 week prior to your class date to pick up supplies in case there is prep work prior to class. Class sizes are limited please sign up early to reserve your space! In the event that any class is cancelled by the shop, paid students will have the option of choosing another class or given a refund.